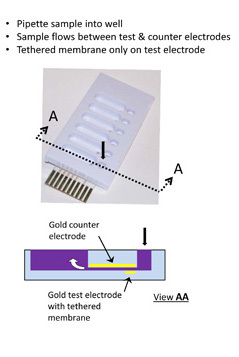 The tethaPlate™ is a 6-chamber sample holder for measureing preparations on surface modified gold electrodes. It is used in conjunction with a tethaPod or tethaPatch system. ​These tethaPlate cartrdges have bare gold electrodes so that the user can apply their own surface modification chemistry. The tethaPlate is delivered in two sections which are assembled with the aid of an Assembly Jig.